Sherry Thomas, author of fab historical romances like His at Night, is offering a three chapter critique via AUCTION. About Sherry: Sherry Thomas burst onto the scene with PRIVATE ARRANGEMENTS, a Publisher Weekly Best Book of 2008. 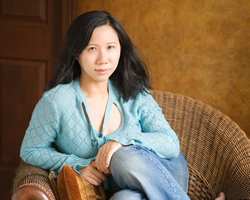 Her sophomore book, DELICIOUS, is a Library Journal Best Romance of 2008. Lisa Kleypas calls her “the most powerfully original historical romance author working today.” In addition to enthusiastic endorsements from trade publications and New York Times bestselling authors, her books have also received stellar reviews from many of the most highly trafficked romance review websites and blogs. Her story is all the more interesting given that English is Sherry’s second language—she has come a long way from the days when she made her laborious way through Rosemary Roger’s SWEET SAVAGE LOVE with an English-Chinese dictionary. She enjoys digging down to the emotional core of stories. And when she is not writing, she thinks about the zen and zaniness of her profession, plays computer games with her sons, and reads as many fabulous books as she can find. Comment on THIS BLOG POST with your bid. Bidding starts at US$1. You may, of course, bid more than once. Once the auction closes, if you are the highest bidder, I will contact you to donate. Please DO NOT donate unless I email you! SERIOUSLY. Donate your winning bid to the mycharitywater campaign page by June 17. If the bid is not donated by then, I’ll contact the second highest bidder to donate, and so-on. Once the donation is made, email me the file. More about Sherry’s critiquing style after the jump, and/or read about her thoughts on critting at Not an Editor. I never offer to critique anyone–that should tell you a thing or two about my critiquing style. 🙂 . Usually writers who come to me are slightly desperate. They’ve had their stuff looked at by their critique partners so many times, nobody knows what’s working anymore. I cackle a bit and make them sign a document saying that yes, as much as it pains them, I can tear apart their beloved chapters without any fear of repercussions. Then I proceed to tear the chapters apart. In other words, I’m much better suited to writers who are willing to take an unflinching look at their work. Are you, dear potential bidder? How has critting helped you grow as an author? I do have a lovely and extraordinarily effective critique partner, but I was not heavily critiqued before I published. So my most important critique experience actually came from my editor, who has had tremendous influence on me–namely, I have rewritten every book from scratch for her. Along the way I have learned a most valuable lesson: It is rarely the story idea that is the stumbling block, but almost always the execution. Therefore, the room for improvement is near infinite. What’s the best thing you learned from a critter or critting? My favorite technique from my critique partner concerns the building of tension during internal dialogue. If you ultimately want your character to decide in favor of a course of action, have the internal dialogue consist almost entirely of why s/he shouldn’t do it–and vice versa. And the worst advice you’ve ever received? I have to say, none. One of the biggest mistakes newer writers make is rushing headlong into a critique relationship. Slow down, take some time to get to know him/her, both as a writer and as a person. I corresponded for nearly two years with my critique partner before we made that leap of faith to the next level. I’m not saying one can’t find a great critique partner really fast, but there are many stories of critique relationships that do not work out and it doesn’t hurt to be cautious up front. Which is the sillier derivative, critting or critter? Do you ever use “critted” as an adjective? Have a funny slogan for your crit in the Crits for Water Campaign? Got a question? Stick it in the comments, pop me an email (kat @ katbrauer.com), or follow me on twitter.